ARc received from the publisher via NetGalley. I've read some of Weir's non-fiction works on the Tudors, and my interest in the subject attracted me to her fictionalized account of Elizabeth I's reign. Any novel depicting the first Elizabeth's reign is going to be ambitious, and while Weir covers a vast amount of territory the focus holds on the lengthy cat and mouse game the queen played with numerous suitors. Naturally her relationship with Robert Dudley takes up the most pages, yet rather than imply political reasons are the motive for Elizabeth remaining unwed, Weir suggests other concerns - how intimacy triggers memories of all the marital strife and difficult childbirths (usually resulting in the mother's death) Elizabeth witnessed in her life. While all this is happening, Elizabeth contends with Mary, Queen of Scots and her supporters. Mary doesn't appear fully as a character here, which disappointed me a bit. Then again, Elizabeth's courtships served as the focus of this story - Mary versus Elizabeth could comprise its own book. 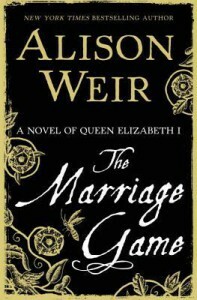 As Tudor fiction compared to other novels I've read, The Marriage Game holds up in terms of historical continuity. Elizabeth as a character seems driven more by emotion than cunning - she strings Dudley along for decades and pouts when he finally gives up. I liked the story, but as a Tudor fan I would probably read more of Weir's non-fiction given the choice.